My memory is a little foggy on some of the details. I was in high school, already a burgeoning trombonist, and already getting in amongst my mother’s collection of classical LPs. At some point, though, I decided to buy one of my own and that ended up being a recording of Bruckner’s Fourth Symphony, with Herbert von Karajan conducting the Berlin Philharmonic. To the best of my recollection, chairman, that was my first classical record. At any rate, that’s my story and I’m sticking to it. Why Bruckner’s Fourth? I had never even heard of the composer, let alone his music, until about a week before. I was taking private lessons with a trombone teacher at Cal State Long Beach and he had gotten me started on what would come to be my daily bread for the next decade or so: orchestral excerpts. In those days they came in books (probably still do), just the trombone parts to famous and not so famous orchestral pieces that had significant contributions from the lower brass: the Overture to “William Tell,” “Ride of the Valkyries,” Schumann’s Symphony No. 3, “Bolero,” etc. Thumbing through one of the volumes during a lesson, we came across Bruckner’s Fourth and I remember my teacher playing the opening theme — two quarter notes, followed by quarter-note triplets, a characteristic Bruckner rhythm — and I thought it sounded pretty interesting and my teacher said it was a good piece, with good trombone parts. That was enough for me. I wanted to hear it. How can I convey the impact that that record had on me? The sound of the Berlin Philharmonic, for one thing, was like nothing I had heard before, plush but gutsy, behemoth but placed by the sound engineers at a certain distance to add to the magisterial magic. Bruckner has a particular way of scoring for the trombones — the parts are often in octaves, and re-enforced by the double basses. This does something to the overtone series it seems, because the trombones sounded huge, monumental. The Berlin trombonists also had a way of adding an extra edge to their tone when playing fortissimo. It sounded like ripping cloth. As a young trombonist I related to it strongly; these Berlin trombonists were my heroes. I imagined myself in their place. I’d listen over and over, very closely, to this record, on headphones. I remember the glow of the amplifier lamps, the glow of the Deutsche Gramophone vinyl, and the special whoosh it made with the needle in the grooves. (It didn’t sound like my mother’s RCA and Columbia records.) I also remember the liner notes in three languages, and the glossy cover with a picture of a frozen white wing, nestled in snow. All of it added up to a kind of teenage fetish. Needless to say, I still have the record, more than thirty years on. This entry was posted in classical music, Video and tagged audio, Berlin Philharmonic, Bruckner, Herbert von Karajan, recordings by pacificsymphony. Bookmark the permalink. Wow, that’s a good one to start with! Very nice performance. 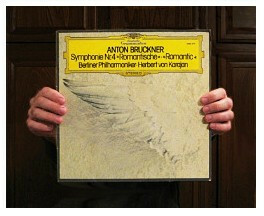 I would love to start collecting classical music on record. I have always had them on CD. Your memory of your first record motivates me even more. I still remember my first classical record on CD…I still have it and listen to it frequently. I will never forget my first very own record bought with the pocket money when I was about 12. It was Zino Francescatti playing Medelssohn’s violin concerto. I always remember my Irish grandmother sounding a impressed with the performance; she had studued with a student of Fritz Kreisler and I was pleased I had bought a performer she was impressed with! I started with the London Treasury LPs. They were a few bucks each. A Brahms First Symphony with Joseph Krips, some Ansermet… One of the first full-price LPs I bought myself was Stephen Bishop’s (Kovacevich’s) Mozart concertos on Philips with Colin Davis: “Elvira Madigan” (K. 467) and K. 503. My piano teacher revered Schnabel, Gieseking and Serkin, but here was a guy a little closer in age to me. It’s still one of my favorite Mozart recordings. I was living in Burlington Vermont. My previous record buying consisted of fantastic jazz. My older brother provided me with a classical music ear with his LP record collection. I had a new Hi Fi record player, so I bought the Brahms violin concerto in D. Wow. I opened all the windows and blasted that sound out into the frigid Vermont air so everyone could feel the ecstasy.